Sorry for the delay in art this week. I think this will set me back a few days. I wanted to do something involving Red Sonja. Originally I wanted to somehow make a drugged drink scene, but I couldn't figure out how to make it correctly. So I changed it to a more general peril type scene. In this drawing, Red Sonja is lying unconscious on a rocky beach, with a barbarian about to stab her. I tried my hand at producing a better background, so my drawings don't look so dull all the time. It's a decent piece to be honest, but I still think last week's Soul Calibur art was better. Hey, I can't hit a home run every time! Donate today, support a great website, and get cool art in return! Thank you! 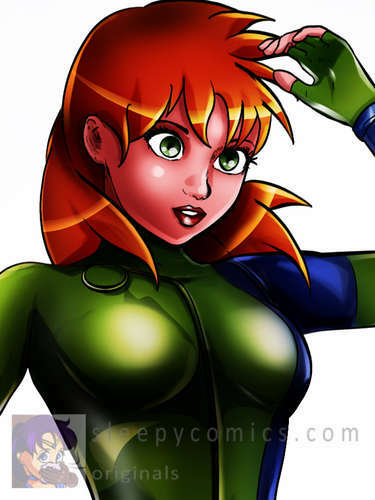 New art this week: Caitlin Fairchild from Gen 13! Hey sleepy fans! I got brand new art for sale in the store. It's my tenth piece so far, which means I've been doing this for two and a half months now! This also means buying the 10 credit package for $8.99 is a great deal now. This week's art is something I wanted to draw for a long time. I think Caitlin Fairchild is one of the sexiest comic girls ever! In my drawing, Caitlin lies unconscious on the floor, while a doctor/scientist stands above her holding a sleeping gas mask. Also for the first time, if you purchase this piece you'll get a second image for free. It's a pinup of Caitlin, a bonus for supporting this site! One thing I love to emphasize about my drawings is how high resolution they are. The actual image is 4000x4000 pixels; around 3.8 MB in size. The thumbnails don't do it justice. So donate today, get some cool art and support a great website! Thanks! I've learned the hard way, that I unfortunately have very limited time. In order to prevent myself from burning out, I have to choose either my art or comic searching. I've decided to focus on my art, instead of searching through comics. Which means you guys, my loyal users, will have to help me find the latest scenes. And you are doing a fantastic job I might add! There are so many places to start your search, and I can even give you a few secret sources if you e-mail me. Two Sue Storm art pieces for sale this week! This week I have two brand new pieces of art up for sale. First, user BobKO generously donated a piece done by ChadTheH. It's a six panel comic showing Sue Storm getting gassed to sleep and carried by Doctor Doom. Stellar stuff! By coincidence, I also created a Sue Storm art piece. This one has her being chloroformed by The Lagoon Monster, based on Fantastic Four issue #124. It's another awesome piece! You can have both drawings for a 99 cent donation to sleepycomics.com. For those who'd like to buy all the art, you can sign up for an account and fund it with credits. 10 credits is $8.99 and lets you download 10 pieces of art. Hi guys, I will be away for a short vacation this weekend. Won't be able to finish this week's art until next Monday, sorry! It's a really cool piece, from a video game. The line art is all done, it just needs coloring. Don't forget about the 99 cent ChadThH artwork for sale! If you only ever bought one piece of art ever, buy the Sue Storm comic. Well worth it! New video game art: Samus Aran! This week's store art features Samus Aran, the main female protagonist of Nintendo's Metroid series. The drawing has Samus in her 'Zero Suit' being carried unconscious. The drawing is set in an arena I saw from Super Smash Brother's Brawl. It's a very high quality drawing and well worth the 99 cent donation. Store sales have sort of dropped, so I may slow down my drawing pace. I try to draw a little every day, but I sometimes get a little lazy. So if it seems like I am not posting anything, don't worry. I still love unconscious and chloroform art, and it's so satisfying to draw my favorite characters in peril. Thanks in advance if you make a store purchase! East Coast people, stay safe! Hurricane Sandy is about to barrel through my city (NYC), so I am hunkering down. Anyone else in the path of the hurricane? If so, stay safe. Also, I probably won't have new art until after the U.S. Election maybe. I unfortunately got addicted to all the political analysis. Just 8 more days until this madness ends. I am debating between drawing a Batgirl or Wonder Woman scene though.